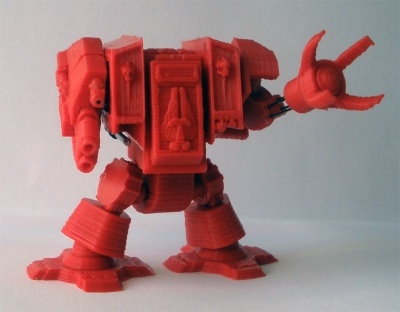 Home » 3d printing , copyright infringement , games , games workshop , law , miniature wargaming , technology , the pirate bay , warhammer 40000 » 3-D Printing: The next battleground for digital copyright law? 3-D Printing: The next battleground for digital copyright law? Anyhoo, it's from the world of 40K which this next item comes from. Seems that Swedish torrent-trackin' site/political party/new religious denomination The Pirate Bay, which has already made a name for itself letting users search for songs, movies, video games and books, has now added 3-D models to its database. Which means that through the ever-improving technology of 3-D printing, it is now possible to download physical objects via the Internet. So only a week or so since The Pirate Bay started offering links to 3-D models and already they're in legal trouble. Lo and behold this first bit o' litigation comes from Games Workshop, the producers of the wildly popular Warhammer 40,000 miniatures wargame. As was reported on the Huffington Post's website, Games Workshop sent a cease and desist order to The Pirate Bay after finding that one user had uploaded a 3-D file from which folks could download a Space Marines Dreadnought. Lemme 'splain why this is significant. In the universe of 40K, a Dreadnought is a bipedal walking tank piloted by a Space Marine who, though grievously wounded and near death on his own, is given a new lease on life as a cyborg. And the model for this attractive bit of tactical tabletop weaponry costs in the neighborhood of fifty dollars American. Now you start to understand why Games Workshop is eager to nip this in the bud before it has a chance to blossom. Games Workshop is charging copyright infringement and The Pirate Bay has acquiesced by removing the link to the model's file. I can see why this will be a problem. And as much as many people complain about the high cost of Games Workshop's models, I for one can understand it. The craftsmanship of that company's artists is top-notch: we're not only buying the models, we're giving compensation to the men and women who come up with these crazy good minis! But even so, and as many of this blog's readers know already, I have a lot of issues with much of digital copyright law, while at the same time absolutely respecting the rights of the content's originators. Wanna know what I think? The quality of the finished products are fairly crappy. At least, they are right now. That won't last for much longer though. And when the time comes when 3-D printing is as ubiquitous on our desktops as the monitor and speakers, companies like Games Workshop should not only be ready for it but embrace it as a new market. I can certainly see Games Workshop selling official 3-D models to print via a client application right at your own computer. Need some new appendages for those Tyranids? Just click "buy" and you'll be entitled to one digitally-rights managed set of horrific slashing arms for your gene-stealers! Need more? Simply add to your quantity of purchased product. Easy-peasey, Japan-easy! Games Workshop gets its due and the end user gets official models and parts for his or her army! Hey, that's the model which has worked wonders for iTunes. I don't see any reason why it won't work for 3-D printing either. There's some exuberant discussion going on right now at Bell of Lost Souls, my favorite 40K-dedicated blog (I visit it several times a day, and they cover a lot of other wargaming mini systems as well). Definitely worth checking out to see what other, more seasoned wargamers are saying about the implications of 3-D printing not only on this hobby but on culture as a whole. Good Lord, that thing is HIDEOUS!! I wouldn't dare bring such a fugly model to the table. Nor would any other respectable 40K player. Even the ones who allowed that one guy to use a Coke can as a substitute for a Carnifex. For a 3D model to actually be infringing though, it would have to be EXACT MODEL of a GW model. That dreadnought is long ways from that. It resembles a GW dreadnought model but still that's one individual's rendition and interpretation. Legally it could be called art and GW won't have a leg to stand on. Just wait til 3D laser scanning becomes common on desktops though. That IS going to be interesting to watch. "BLOOD FOR THE BLOOD GOD!!"